The Vision S60 is a commercial suspension elliptical trainer that improves upon the S7100HRT model with more durable construction and other enhanced features. 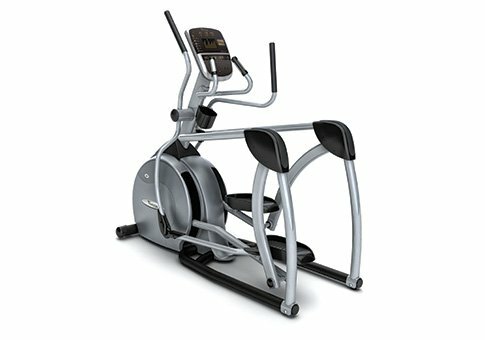 The S60 Commercial Suspension elliptical features PerfectStride technology, giving you the most natural, smooth motion to maximize your results. An LED display shows you relevant workout metrics such as speed, distance, watts, resistance, heart rate, calories and RPM. Check out the popular S60 on sale now at the Vision store! Reviews on the S60 are very positive, as the experts appreciate the attention to detail and the quality components that Vision provides. Although this is a commercial grade model, many choose to purchase it for the home as they know it will last for years and years, even with heavy usage by multiple family members. The S60 has a 21" fixed stride, as opposed to the adjustable stride on its S7100HRT counterpart, and a 9" step on height. The suspension design gives you the feeling that you are working out suspended in air, which is definitely a different experience that on a traditional elliptical machine. It is very smooth, natural and quiet, and the way the pedals are positioned it puts you in the ideal position to train properly. The console is very basic, but functional, providing the necessary workout metrics for you. You get a very generous 21 built in workout programs, with Vision's patented Sprint 8 interval training program along with hills, fitness tests, cardio, distance and other target programs. You also get 25 different resistance levels, so between that and the workouts you get plenty of variety. Another good feature of the S60 is its compact footprint...it is about 8 or so inches shorter than some other machines, which makes it ideal for smaller spaces. All in all, the S60 is a great choice if you're looking for a commercial grade elliptical trainer. The Vision S60 is a great elliptical trainer from a company known for making high quality exercise equipment. At around $3199 on sale, it may be a bit out of range for some users. You can save yourself about $600 and go with the S7100HRT, which is more of a residential model. You get less workout programs but you do get adjustable incline which the S60 does not have along with a few additional features. If you want adjustable stride and incline capability, take a look at the S70 model as well. Either way, Vision is a brand that you can trust, and their customer service is better than most of the other players in the field.